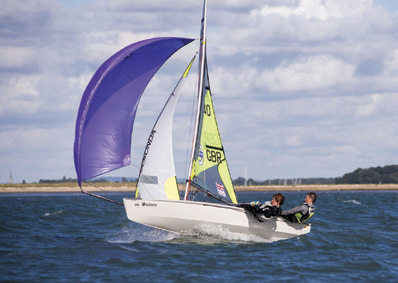 Launched in 2004 by RS Sailing in Hampshire, England, the RS Feva is wildly popular in Europe with an established local, regional, national and continental racing scene. Over the last few years, yacht clubs and community sailing centers throughout the U.S. have likewise embraced this 12-foot doublehander for their training and junior racing programs. In the Northeast, there are growing Feva fleets at Barrington Yacht Club on Narragansett Bay, and Huguenot Yacht Club, Riverside Yacht Club, Larchmont Shore Club and the New York Athletic Club Yacht Club on Long Island Sound. The Feva fills a niche between the Optimist and the Laser or Club 420, and program directors appreciate the ruggedness and low cost of its roto-molded polyethylene construction. The boat is also a hit with young sailors, who can easily rig it and are stoked with its performance. With “S,” “XL and “XL Race” versions available, the Feva is a “scalable” boat that young sailors can enjoy for several seasons as they progress, and its high volume hull means it will remain fast and fun to sail as they grow. To learn more about why the RS Feva may be the ideal boat for your junior program (or your family), log onto rssailing.com/us. The newest model from RS Sailing, the RS Aero is redefining high performance among non-trapezing, non-foiling singlehanders. With an ultralight hull weight of 66 pounds (less than an Optimist! ), virtually anyone can lift this 13- footer onto a car roof rack, and it’s very easy to rig and launch. the RS Aero is the Lotus Elise of singlehanded dinghies. Three rig options are available, all with carbon fiber spars. With 54 square feet of sail area, the Aero 5 rig is ideal for youth sailors from 75 pounds and up, the Aero 7 (77 sq. ft.) suits women and light men, and the Aero 9 (93 sq. ft) is for men up to approximately 210 pounds. Custom-designed carbon options include a tiller extension, brackets for Tacktick or Velocitek electronics and a GoPro video camera mount. The exclusive RS Aero distributor in the Northeast is The Boat Locker in Bridgeport, CT. Check rssailing.com to learn more. Special thanks to Scott Hardy, owner of The Boat Locker, for his assistance with this article.The Boat Locker will be moving soon to a new location in Bridgeport, CT and is the exclusive Northeast distributor for the RS Feva and the other exciting models in the RS Sailing range.